In a last hurrah to a stellar career, John Smoltz got one win for the Cardinals and it was a gem. On Jan. 6, 2015, Smoltz was elected to the National Baseball Hall of Fame in his first year on the ballot. The right-hander is the only big-league pitcher with 200 wins and 150 saves. He also earned 15 postseason wins: seven in the National League Division Series, six in the NL Championship Series and two in the World Series. If not for the opportunity given to him by the Cardinals, Smoltz would have had a sour ending to his career. Smoltz pitched for the Braves from 1988 through 2008. He made his last appearance for them on June 2, 2008, before undergoing season-ending shoulder surgery. A free agent, Smoltz signed with the Red Sox in 2009. He was a flop, posting a 2-5 record and a 8.32 ERA in eight starts. On Aug. 7, 2009, the Red Sox designated Smoltz for assignment. Ten days later, they released him. The Cardinals, in first place in the NL Central, were seeking pitching depth. They had tried four pitchers as the fifth starter _ Todd Wellemeyer, Brad Thompson, Mitchell Boggs and P.J. Walters _ and weren’t satisfied with any. They also wanted to bolster the bullpen. Cardinals third baseman Mark DeRosa, who had played with Smoltz for seven seasons with the Braves, suggested to general manager John Mozeliak and manager Tony La Russa that the pitcher would be a good fit with the Cardinals, according to Joe Strauss of the St. Louis Post-Dispatch. DeRosa and Smoltz also were represented by the same agency. On Aug. 19, 2009, Smoltz, 42, signed with the Cardinals for $100,000. The team planned to give Smoltz two starts and then determine whether he would remain in a rotation with Chris Carpenter, Adam Wainwright, Joel Pineiro and Kyle Lohse, or move to the bullpen in a setup role for closer Ryan Franklin. “There is no down side to this move,” Carpenter said. Two days after Smoltz signed, Lohse suffered a groin injury running the bases and was placed on the disabled list. 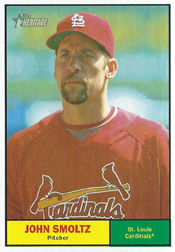 The Cardinals saw Smoltz as the replacement for Lohse. The question was whether Smoltz could be effective. On Aug. 23, 2009, Smoltz provided the answer. In his first Cardinals appearance, Smoltz started against the Padres at San Diego and displayed the form that had made him an eight-time all-star with the Braves. Smoltz struck out nine, including seven in a row, in five innings and held the Padres scoreless. Using a mix of split-fingered pitches, a slider, curve and fastball, Smoltz struck out the last batter of the second inning and struck out the side in the third and fourth innings. Smoltz stayed in the Cardinals rotation, made seven total starts and finished 1-3 with a 4.26 ERA. His ERA was 3.18 before he got shelled for six runs in four innings in his final career start on Sept. 30, 2009, against the Reds at Cincinnati. His final career numbers: 213-155 with 154 saves, 3,084 strikeouts and a 3.33 ERA. In the postseason, Smoltz was 15-4 with a 2.67 ERA and 199 strikeouts in 41 games. Against the Cardinals, Smoltz was 11-11 with a 4.13 ERA in 40 regular-season appearances, including 29 starts. He was 2-0 with a 1.20 ERA vs. St. Louis in the 1996 NL Championship Series.